Even if the milonga is a musical genre closely related to habanera and tango, in Argentina it also refers to the place where tango lovers go dancing. In the hall, there are orchestras or musicians playing live and some of them offer tango lessons even if this is a specific practice in the academies. The milonga porteña has its own codes and rituals, but it also defines a tango style: the tango milonguero, which differs from stylized tango, more characteristic of tango shows. Many places in Buenos Aires invite visitors to enjoy tango dinner shows in which, along with a national and international gastronomic proposal introduce dancers, singers and orchestras displaying the grace and the glamour of this musical genre from the Río de la Plata area. Here, tango shows off before those who come along to appreciate its charm. And logically, it gets all the applause. Cultura Cercana Lavalle 1546 - P. 5° of. F, Ciudad de Buenos Aires. We take you down to the sites where the Argentinians get together to dance and listen to tango in a natural and spontaneous way, not choreographic (tango salón). Tango Porteño Cerrito 570, Ciudad de Buenos Aires. A beautiful place to enjoy Argentinian tango. Just a few meters away from the porteño obelisk, where the old and beloved Cine Metro used to stand, Tango Porteño offers everything for visitors to enjoy an excellent evening: dinner and tango show live with the best singers and dancers in town. Señor Tango Vieytes 1655 - Barracas, Barracas - Ciudad de Buenos Aires. Inspired by the tango singer Fernando Soler. Live shows with excellent staging. Its large halls can accommodate 1,500 people. Neat gastronomy. Rojo Tango Martha Salloti 445 - Puerto Madero, Ciudad de Buenos Aires. At the exclusive Hotel Faena, an international show displays the beginnings of tango in 1900 to the times of Piazzolla. Piazzolla Tango Florida 165 - Galería Güemes, Microcentro, Ciudad de Buenos Aires. Art and show center in the historical General Güemes porteño gallery. Tango academy, art gallery and store. Café Triunfal for conventions and events. Madero Tango A. M. de Justo y Brasil - Dique 1 - Pto. Madero, Puerto Madero - Ciudad de Buenos Aires. The best tango artists and orchestras live, accompanied by exquisite Argentinian signature cuisine. La Ventana Balcarce 431 - San Telmo, Ciudad de Buenos Aires. Tango show and dinner in an old restored conventillo. Four rooms with tango singers and orchestras, bands and folk ballet. Classical grilled meat, international menu and regional dishes. Esquina Homero Manzi Av. San Juan 3601, Ciudad de Buenos Aires. A place where an art gallery, shows, tango lessons and international cuisine co-exist. Private parking and trasportation service. Esquina Carlos Gardel Carlos Gardel 3200, Almagro - Ciudad de Buenos Aires. Opposite the Abasto, classical tango place. Live shows with dancers, singers and orchestras. Cuisine with renovated Creole and international dishes. El Viejo Almacén Av. Independencia y Balcarce - San Telmo, Ciudad de Buenos Aires. 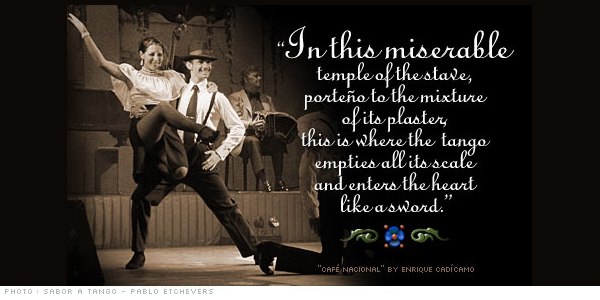 A traditional tango place, founded by tango singer Edmundo Rivero in 1969. National and international à la carte gastronomy. Private parking. El Querandí Perú 302 - Monserrat, Ciudad de Buenos Aires. A large house from 1920 declared historical monument. Dinner with delicious international à la carte menu and exclusive wines. "Nuestro tango" show presented by excellent dancers. Complejo Tango Av. Belgrano 2608 – Balvanera, Ciudad de Buenos Aires. Tango show with orchestras directed by great masters, dancers and singers. The menu includes international and typical dishes. Dancing academy with private and group lessons. Boca Tango Brandsen 923 – La Boca, Ciudad de Buenos Aires. Next to the mythical Boca Juniors Stadium, BocaTango offers dinner in a spectacular restaurant serving typical countryside meals, an amusing farce in the conventillo and a spectacular tango show at Café de los Vitraux, the most beautiful cabaret in Buenos Aires. Enjoy a unique night in the company of more than 30 artists. Tango Ideal Suipacha 380, San Nicolás - Prov. de Buenos Aires. live orchestras and dancers show at the Ideal coffee-shop, declared historical heritage. Sin Rumbo José P. Tamborini 6157, Villa Urquiza - Ciudad de Buenos Aires. Traditional large room with great masters. Buffet and bar service. Surveilled parking. Salón Canning Scalabrini Ortiz 1331, Palermo - Ciudad de Buenos Aires. Tango and other rhythms with live orchestras. Rouge Tango Scalabrini Ortiz 1331, Palermo - Ciudad de Buenos Aires. t the Canning Dancing Hall. Air conditioning. Porteño y bailarín Riobamba 345, Balvanera - Ciudad de Buenos Aires. Conditioned hall. Programs with musicians, singers and career artists. Parakultural (La Catedral) Sarmiento 4006, Almagro - Ciudad de Buenos Aires. Niño bien Humberto Primo 1462, Constitución - Ciudad de Buenos Aires. Thursday Milonga and Tango classes. Malevaje Venezuela 2939, Balvanera - Ciudad de Buenos Aires. at the Carbonería, a hall from 1901, tango milonguero and tango de salón. Young orchestras, plastic artists and singers. Bar with homemade dishes and Italian menu. La Marshall (Milonga gay) Maipú 444, Almagro - Ciudad de Buenos Aires. Milonga from 10pm. Intensive courses and artistic and cultural display. La Baldosa Ramón L. Falcón 2750, . Essa Milonga Córdoba 5064, Ciudad de Buenos Aires. This is a new tango space whose purpose is to break with all the traditional schemes of the milonga in order to generate a joyful and visually esthetic environment. The Club Villa Malcolm's ballroom has been decorated as an old cantina, with colorful lamp garlands and pennants. Dancing lessons, always in charge of prestigious instructors, videoart and special shows certainly make all the difference. El Arranque Bartolomé Mitre 1759, San Nicolás - Prov. de Buenos Aires. Club Gricel La Rioja 1180, San Cristobal - Ciudad de Buenos Aires. Milonga on Fridays and Saturdays. Centro Cultural Torcuato Tasso Defensa 1575, San Telmo - Ciudad de Buenos Aires. Legendary place where the tango was born over a hundred years ago. Live orchestras. Times and prices have been provided by each venue and they are subject to modifications without prior notice. was the same in my soul. and a hope for love. of not to think of myself. but still he guides me. And I gave up with no fight.